Recently we spent our Saturday attending a first ever major in-store event at Sunfish Cellars. They had over 15 tables and over a 100 bottles of wine and beer open along with a cheese/charcuterie set with their vendors so their customers could come and sample. At the same time they offered a huge wine sale. The beauty of it all was that the event was FREE. I sent a note out to the “Winers” group to see who wanted to go. Silvia, Dwayne and Heather and Dave wanted to join. Since the event started at 2pm I was certain it would be packed and I suggested we leave in time to arrive shortly after 2pm. The weather was finally cooperating and it was fairly nice outside. The parking lot was filling up and and many people were walking in. We were greeted by the friendly Sunfish Cellars gang with a smile and an empty glass. We proceeded to the first table to sample a few wines. After a couple sips we decided to order a couple flat bread pizzas from their dining area as we figured we should have a small base before working our way through the numerous tasting tables. Eventually we ventured up stairs to the other tables sampeling various wines. We found many affordable wines that were really good. Both Chris and I made notes on our tasting sheets for future reference. We found ourselves by a table tasting a couple Alexander Valley wines. While talking to one of the gals pouring wines she mentioned that one of the wine makers was there visiting customers. This immediately sparked an interest and we headed over to talk to him. We met Gordon Drake of William Gordan Winery. We learned that Gordan is a Minnesota resident and travels to California every month for ten days or so. He and his partner Bill Pesonen started the winery in the 1990s. William Gordon Winery is the result of a shared passion for wine between the two of them. Their grapes are grown on the eastern slopes of the north end of Alexander Valley in Sonoma County and have also been used for Geyser Peak, Silver Oak Alexander Valley, and Jordan Cabernet. We started visiting about the areas we favor and mentioned that someday we hope to purchase a place in the valley. We would like something in Sonoma valley such as Windsor or maybe even a bit north depending on the price. Gordon told us he bought a nice place with some acreage north around Cloverdale, which is a bit north of Healdsburg. It was clear we shared the same passion of wines and desire to live full time in the valley eventually. He talked about the varieties they grow and produce. One of Chris’ favorites is Syrah and he mentioned that they have a pretty good Petite Syrah that Sunfish Cellars happens to sell. I purchased a bottle of the Pettite Syrah as well as an Alexander Vally Cabernet Sauvignon prior to leaving. We found Gordon’s Cabernet Sauvignon quite impressive in quality and style. The wine was a little smokey (which Chris loves) and as we were winding down our conversation we exchanged business cards. We mentioned our upcoming trips and wondered if they had a tasting room. Their tasting room is in Cloverdale so we will have to make a point to see them soon. The next day Chris decide to prepare home made pizza. 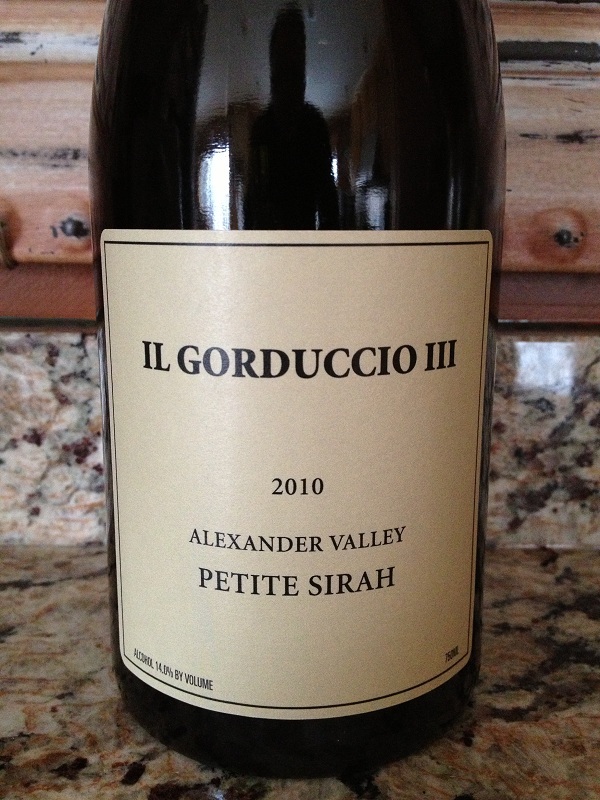 I usually enjoy Italian wines with pizza but I wanted to try the Petite Syrah from William Gordon Winery instead. As she started her prep work I decided to pull the cork and pour us a glass. As you know Chris loves to have a glass of wine while she cooks. And sometimes she even cooks with the wine! Here are my tasting notes. Deep color depth. The color hue was dark purple to inky and was very clear. The Petite Syrah was very aromatic before I swirled it in my glass. The development was young and fruity, while I noted smoke, spice, black current and dark fruits. This wine was not dry, but was a full bodied and the acidity was nice. It was not tart or flabby and the tannins were medium to soft. I could feel them in the middle of my palate and as time progressed they were felt more on the sides of my tongue. The wine was very flavorful. My initial flavors were mineral with spice and oak notes with a complex start and soft long finish. abv: 14% The alcohol content is lower than other Petite Syrah’s. The higher Petite Syrahs sometimes have an alcohol nose that is not attractive. How Much? I paid $26.99 at Sunfish Cellars. 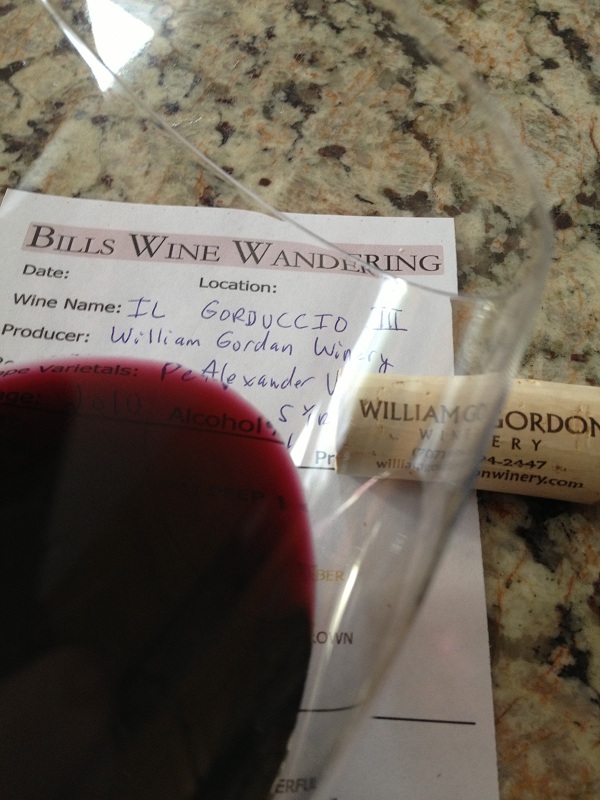 I rated the 2010 IL GORDUCCIO III Syrah from William Gordan Winery two glasses.